White Label Space: Where Shall I Land my GLXP Mission? If you are trying to decide where you should land your Google Lunar X PRIZE (GLXP) rover on the surface of the Moon, maybe you'd like to keep some of these tips in mind. The Moon's surface has two main types of terrian - "maria" which are relatively smooth, and "highland plains", which are rougher. 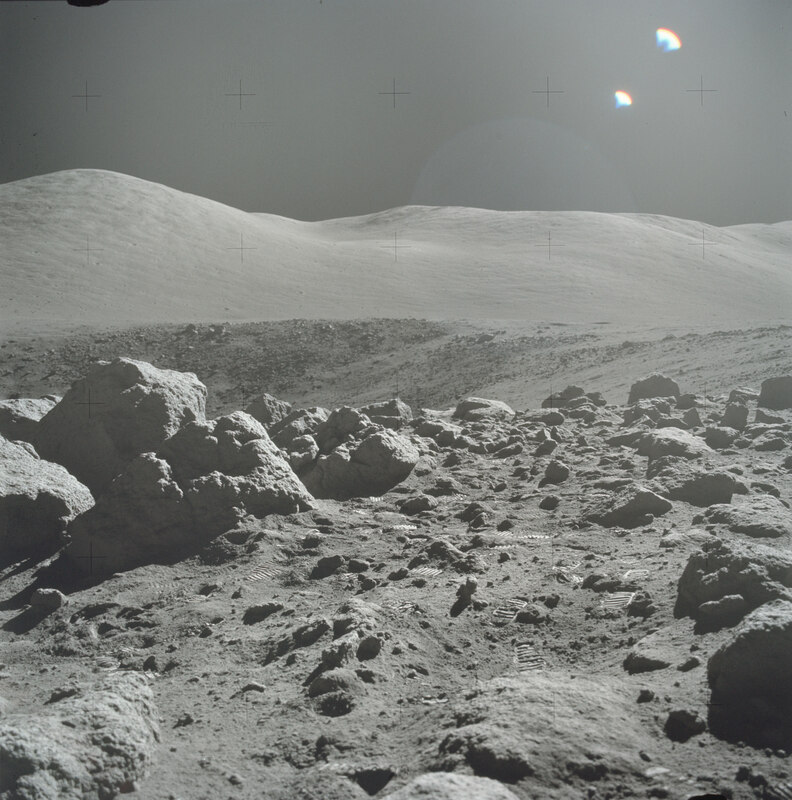 The 21 missions to date by Russia and the USA that successfully landed on the Moon all targetted maria regions except Apollo 17 which targeted a maria/highland boundary area, giving rise to the most dramatic close-up photos of the Moon's surface available, such as the above photo of Camelot Crater (linked from Google Moon). Craters are the most important features that you need to consdier. They determine the boulders and slopes at your landing site. Craters come in all sizes and large craters can have central peaks, terraces and rims that are particularly troublesome. The areas near the rims of craters have the thickest regolith deposits and the largest boulders. Boulders tend to get smaller the further you are from the crater rim. Over thousands an millions of years the surfaces of the Moon are gradually smoothed out by the constant bombardment of meteorites so older craters are less troublesome than newer ones. The distribution and age of the craters in your targetted GLXP landing site is something you will need to investigate. If you are thinking of landing near the south pole to look for water and win the $5 million GLXP Bonus Prize, Beware!.. the surface there is more rugged than the rest of the Moon, consisting of ancient and heavily cratered highland terrian. This poses problems both for the lander and the rover. To date, no machine has landed on the Moon using an automatic system to avoid hazards. Although, the Apollo missions had one of the finest landing systems ever created - the eyes, brains and hands of top aviators highly trained for that specific purpose. Unfortunatley, it is unlikely that GLXP teams will be able to afford that luxury.